Centerra in March reduced its expected output from Kumtor by a third after faster-than-expected ice movement in the south-east section of the high-altitude openpit operation made it unsafe to access the block of ore intended to feed the mill from March to October. The company instead focused its efforts on the south-west of the pit to access a new block of ore, which it reached in September, while simultaneously working to offload the waste ice and waste responsible for the movement, effectively cutting back the glacier. The company had again revised its consolidated full-year gold production guidance down to between 415 000 oz and 425 000 oz, from between 450 000 oz and 470 000 oz. In mid-September, mining at Kumtor reached the ore in the south-west section of the pit and the mill restarted as planned, but production since then had been less than expected. As the mine transitioned between waste rock and ore, Centerra encountered an irregular till/bedrock contact, which increased the amount of till waste material mined. “This impacted the planned production for the fourth quarter and has resulted in our revised production guidance for the year. By the end of October we had mined through the till/ore interface and we do not expect to have a similar issue going forward,” CEO Ian Atkinson told Mining Weekly Online in an interview. The miner produced 72% less gold for the three months ended September 30 at 42 723 oz, compared with production of 154 936 oz of gold in the same period a year earlier. Of this, the company sold 41 251 oz at an average realised price of $1 777/oz. This had resulted in revenue dropping 75% to $68.8-million, compared with revenue of $278.4-million in the same period a year earlier. 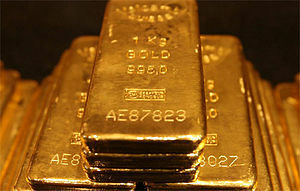 Cash costs totalled $1 401/oz of gold produced, 152% higher than $556/oz it cost a year earlier to produce an ounce of gold. Centerra posted a net loss of $46.8-million or 20c a share, and included $19.3-million recognised as abnormal mining costs, and other operating expenses of $5.2-million for the care-and-maintenance of the underground development project at Kumtor. For the same period in 2011, the company recorded net earnings of $83.7-million or 35c a share based on revenues of $278.4-million, reflecting significantly higher gold production and sales at that time. The adjusted loss was 10c a share, beating analyst expectations of a loss of 21c a share on expected revenue of C$102.75-million. Meanwhile, Centerra had increased its proven and probable reserves in the openpit Kumtor mine by 58% to 9.7-million ounces, extending Kumtor’s mine life by five years to 2026. The company expected Kumtor to produce 600 000 oz in 2013 and 660 000 oz in 2014. At the company’s Boroo operation, in Mongolia, better gold production was achieved in the third quarter, as the higher-grade Pit 6 ore was processed. The heap leach facility at Boroo also resumed operations after receiving regulatory approval and all required permits in September. The mine produced 18 938 oz in the period, compared with the 13 719 oz in the third quarter of 2011. The company’s Gatsuurt project, also in Mongolia, remained under care-and-maintenance during the third quarter owing to continued delays in permitting resulting from the Water and Forest Law which prohibits mining and exploration activities in water basin and forest areas. Atkinson noted the government had realised the restrictive nature of the legislation on mine-licence holders, and had initiated efforts to revise the legislation. The company’s Toronto-listed shares fell 3% on Thursday to C$10.49 apiece.